Features a split-screen display, 5 mp camera, 7000 mAh battery, and 3G SIM with voice calls. 10.1" WXGA TFT LCD capacitive touchscreen, with pixel dimensions of 1280x800 and 16M colours. Exynos 4412 SOC (System On Chip) with 1.4 GHz Cortex-A9 quad-core CPU, Mali-400MP GPU, and 2 GB RAM. Android 4.0 (Ice Cream Sandwich). Quad-band GSM (850 \ 900 \ 1800 \ 1900 MHz), quad-band 3G (850 \ 900 \ 1900 \ 2100 MHz). 5 mp main camera with LED flash and 1.9 mp front camera; Shot Mode: Single \ Smile \ Panorama \ Cartoon \ Timer shot; Photo Effects: Negative \ Black and white \ Sepia; White Balance: Auto \ Daylight \ Cloudy \ Incandescent \ Fluorescent; Features: Auto Focus, Face Detection, Smile Detection, Blink Detection. 16 \ 32 \ 64 GB internal storage (only 16 GB in India), 32 GB microSD card slot. HD (720p) recording at 30 fps. Supported video formats: 3GPP, H.263, H.264, MPEG4, WMV; Supported audio formats: MP3, AAC, AAC+, eAAC+, AMR, AMR-NB, H.263, MPEG4. Bluetooth 4.0 LE, USB 2.0 High-Speed, Wi-Fi 802.11a/b/g/n with Channel Bonding, Assisted GPS, HDMI-Out, 3.5 mm jack. S Pen for sketching and handwriting input. 10.3" (w) x 7.1" (h) x 0.35" (8.9 mm) (d), 583 grammes. While Samsung claims that the battery provides 33 hours of talk time, this seems rather unlikely considering its screen size. The slate also supports a split-screen mode that lets you use two apps simultaneously, while the bundled stylus allows you to sketch using the preloaded Adobe Photoshop Touch. 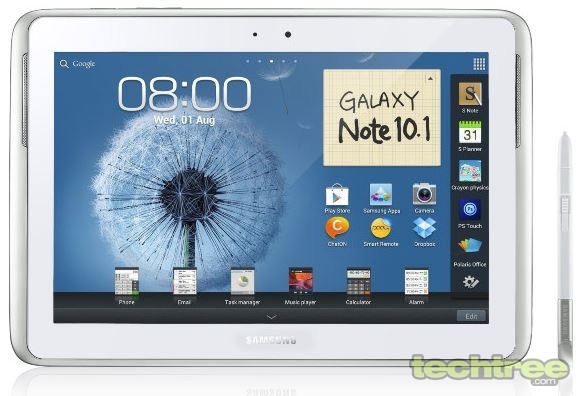 The 16 GB Wi-Fi + 3G version of the GALAXY Note 800 is available at the manufacturer's official online store for Rs 38,500. Samsung will also give away a free book-type cover worth Rs 3300 for those who have pre-booked the and made the balance payment by Monday. Customers who do not pay within 15 days of the launch will lose their advance deposits. Check out the gallery below for some ultra high-res product images.